IndiaFacts published a fabulous interview with the world's foremost Indology and Mahabharata expert, Prof Vishwa Adluri. Why were these scholars cited as expert authorities, when their work was erroneous (269–74)? Why did scholars fail to detect problems as grave as racism and anti-Judaic and anti-Brahmanic biases, when universities are supposedly bastions of liberal values such as non-discrimination and religious tolerance? Why did academics, who are paid high salaries to discriminate between good and bad scholarship, not notice the many technical errors in their colleagues’ work? Finally, how have the Indologists contributed to pedagogy and ethics in their own countries? Except for claiming that certain sections of the Indian population require enhanced oversight, they have not contributed to pedagogy of Indians. Rather, they have used their institutional status to bait Indians, mock their values, seek the thrill of playing stereotypes of East and West against each other, and provoke phony outrage to propel their own careers." "Whereas The Nay Science focused on literary and historical aspects (so-called higher criticism), Philology and Criticism focuses on technical aspects (so-called lower criticism). Philology and Criticism is more abstract and technical, but it is actually the easier book to read." "I do not understand what the Indologists do or why they are paid for it. Most Mahābhārata scholarship is jejune. The Indologists barely contributed to pedagogy in their home countries." "I see the Twitter battles, the Marxist-baiting, the arguments over whether the Mahābhārata “really happened,” and the waste of resources determining the dates of the Kurukṣetra war or the moment Bhīṣma fell, and it saddens me." "I see Indians at conferences knowing of no higher purpose for Sanskrit than to sing stutis praising their European colleagues, and it fills me with shame." "I see the Indian government endowing Sanskrit chairs at foreign universities while institutes in India are destitute, and I despair. I see German scholars awarded grants and prize monies while Indian students go barefoot, and I wonder: will Indians ever learn?" "Romila Thapar is considered an expert on ancient India, yet her work recirculates the racial and anti-Semitic views of Lassen, Holtzmann Jr., Hopkins, and others already critiqued in The Nay Science." "so-called critical scholarship originated with German Protestantism"
"German Indologists such as Christian Lassen, Adolf Holtzmann Jr., and Hermann Oldenberg ... imported racial prejudices into Mahābhārata studies—for example, that an original, heroic epic existed that reflected the Indo-Germanic or Aryan worldview..."
"The idea of an “original” Gītā, moreover, emerged with Adolf Holtzmann Jr., who claimed that there must have originally been a shorter, “heroic” version of the poem that would have been appropriate to the Indo-Germanic warriors." "contemporary scholars such as Mislav Ježić had fudged their own criteria to fit this prejudice. They were frightened to contradict the academic dogma the German scholars had instituted." " Sukthankar created the critical edition to defend the Mahābhārata. He wanted to show that the text, as far back as we can scientifically reconstruct it, validates the traditional reception of the Mahābhārata as a dharmaśāstra and a mokṣaśāstra." 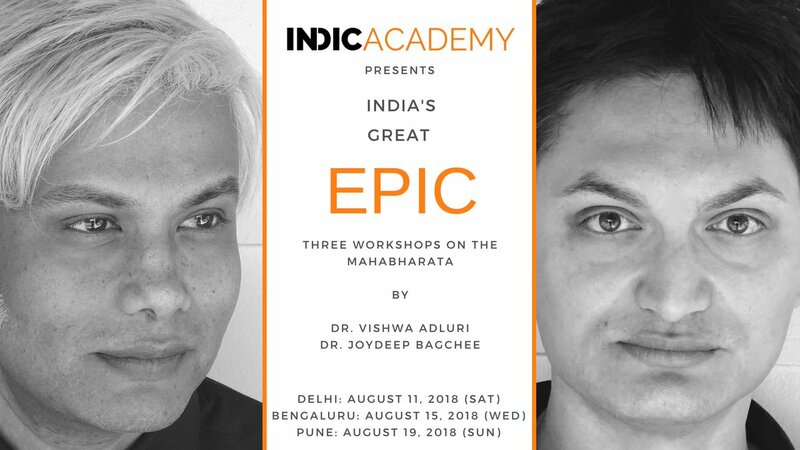 For less than the price of a dinner and a movie, you get to hear and watch the world's foremost Indologist demolish pernicious distortions against the Mahabharata propagated by Hinduphobes like Wendy Doniger. Do attend the workshop in any of the three cities over the next two weeks! See http://www.indicacademy.org/ for more details.